The attribute of soccer IQ at it’s most basic level describes a players ability to make good decisions in a soccer match. The best players in the world have an extremely high soccer IQ. In other words they are not just great dribblers, passers, and shooters; their ability to make excellent decisions in a moments notice is what sets them apart. This article describes three important components of soccer IQ and ways to improve each one. The three components include decision making, being in the right place at the right time, and reading the game. At any given moment in a soccer match, all 22 players on the field are making decisions. The decisions that are made over the course of the game add up and have a cumulative effect. Often times, the team that makes more good decisions will win the game. On the other hand, soccer is a game of mistakes. A team can make good decisions 99% of the time and still lose if their opponent capitalizes and punishes them for one or two miscues. This goes to show that while making good decisions is important, avoiding critical mistakes may be one of the most important aspects of having a high soccer IQ. With that being said, no player is perfect. Even the best players in the world makes errors from time to time. What is most important is that players don’t dwell on their miscues. At the youth level, coaches should treat mistakes as learning opportunities. This way players won’t get discouraged when they mess up. Decisions in a soccer match can be broken down into two categories. What a player does with the ball, and what they do without it. When a player has the ball, they really have three choices. They can dribble, pass, or shoot. The best players in the world keep track of where their teammates and opposing players are at all times. Due to this high level of awareness, they usually know what they are going to do with the ball before it comes to them. Thinking one step ahead is the best way for players to make good decisions. On the other hand, what players do when they don’t have the ball is vitally important. In a 90 minute soccer game, any given player will have the ball at their feet between one to two minutes. Because this is such a minuscule amount of time, most of a players contribution to their team is made up of what they do when they don’t have the ball. Therefore, decisions such as making runs off the ball on offense and knowing when to apply pressure versus sitting back on defense can have an enormous impact on the outcome of a game. One of the easiest ways to improve decision making is to have players play quickly. Speed of play is one of the biggest things that separates professional soccer players from amateurs. The professional game is extremely fast. Therefore, professionals have to process the game and make decisions much more rapidly than players at lower levels. As players play at higher and higher levels, speed of play is one of the first things to increase. For this reason, the best way for players to get better is to play at the highest level possible. Playing with bigger, faster, and more talented players will force an individual to adapt and make decisions at a quicker rate. A great drill to improve decision making is the three grid possession drill. In this drill players have to think quickly to make accurate passes to their teammates. In addition, they have to find a way to play a long pass to the opposite side once they have completed six passes. Another excellent drill for players to work on making decisions is points for goals and passes. 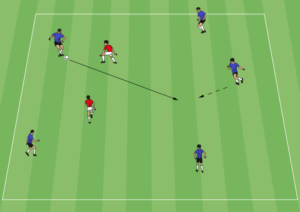 This game rewards teams for keeping possession of the ball as well as scoring. Due to the fact that players want to keep possession of the ball in this game, they are more likely to make smart passes. This reinforces positive decision making. Furthermore, half field attack is useful to help players improve their decision making in the final third. 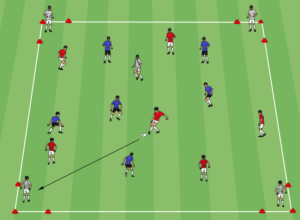 In this game players practice breaking down the defense to create goal scoring opportunities. 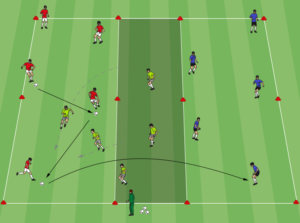 Finally, many keep away drills such as two teams against one, rondo keep away, and possession with neutrals in the corners can help players think one step ahead. Players with a high soccer IQ understand the importance of being in the right place at the right time. They constantly move on offense to find space and passing angles to support their teammates. On defense, they shift and move to take away space from their opponents. The best players always put themselves in positions to succeed. One player who is a great example of movement off the ball is the German forward Thomas Müller. Although Müller isn’t the biggest or fastest player, he has excellent fundamentals and always seems to be in the right place at the right time. His impeccable soccer IQ gives him a tremendous advantage. For this reason he lead the German team in scoring at the past two World Cups and earned the golden boot in 2010. The video below provides a tactical analysis of how Thomas Müller creates space for himself and his teammates. To be in the right place at the right time, timing is everything. Making a run into space at precisely the right moment gives a forward a huge advantage over a defender. This is one reason why having a high soccer IQ is so important. Regardless of a players speed or physical capabilities, the player with the better instincts will usually get a head start. The best way to improve soccer instincts is through experience which is why practice is so important. In addition, soccer is a game that is all about space. The more space a team can find on offense, the more time players will have on the ball. As with the case of Thomas Müller, offensive players who know how to create space have more time to process the defense and therefor make better decisions. On defense, if players position themselves correctly they’ll have an advantage. The best defenders can anticipate what the offensive team is trying to do and they are proactive in putting themselves in a great position. An excellent drill to help players practice being in the right place at the right time is find the final pass. In this drill teams earn points by playing to a teammate who finds space in the middle of the field. In addition, large goal overload is an excellent game where players have to find space to break down a defense. Finally, a great game to work on creating space and opening up space for teammates is keep away with defenders in zones. Players with a high soccer IQ do an excellent job of reading the game. In other words they are aware of what’s around them, they have good vision on and off the ball, and they can read cues from opponents. Although the best way to get better at reading the game is through experience, there are certain things players can do to help. One player who is excellent at reading the game the Spanish midfielder Xavi. He has great vision and he always knows what is around him. The video below breaks down Xavi’s game and really makes you appreciate how great of a player he is. Notice how Xavi looks over his shoulder before receiving a pass so that he knows how much time and space he has. He also uses his peripheral vision to know where his teammates are. Furthermore, reading the game is advantageous on the defensive side of the ball. By watching closely, defenders can anticipate what attackers are going to do. For example, if an attacking player is winding up, defenders should anticipate a long pass. In addition, by reading the game defenders can pick up cues such as when to pressure and when to stay back. For instance, if an offensive player has the ball and is facing their own goal, that is a great time to apply pressure because they can’t play forward. The mini goal with neutrals outside is an awesome small sided game to help players develop awareness of what is around them. In addition, keeping count with neutrals outside can also be useful for developing awareness. Play At The Highest Level Possible– Playing with bigger and faster players will make you better and help you improve your soccer IQ. Work On Making Decisions Quickly– Always try to think one step ahead. Play with one or two touches whenever you can. Watch & Learn From World Class Players– A great way to learn is to study the tricks of the trade from the worlds best. For instance, in this video we learned from Thomas Müller and Xavi who are both great examples. Another great player to watch would be Philipp Lahm. Be Proactive– Run to spaces where you think the ball is going to go. Don’t be afraid to make mistakes. That’s how players learn and get better! Communicate– Always communicate with your teammates on the field to help each other. Saying things like ‘man on’, ‘turn’, or ‘time’ gives players information about how much time and space they have so that they can make good decisions. Visualize– Picture in your head what you want to do before a game begins. This way win you experience situations in the game, you’ve seen it before in your head. Practice– The best way to improve soccer IQ is through experience so play as much as you can. For more on soccer IQ, I highly recommend taking a look at Dan Blank’s best selling book on Amazon. It is very well written and contains tons of practical tips for soccer players.